I tend to get up before everyone else in my house. No matter how late I go to bed, I’m up first and I usually have an hour or so to myself. Typically, I spend it on the computer, surfing. I follow up on random thoughts, check out obscure news, add books to my library “to read” list – the usual kind of stuff. But today I was a bit weirder than usual. I started with checking airfare rates to London and tour packages – mind you, there is no way I’m going to be able to go any time soon, but what the heck, I can dream, right? BTW, British Airway has $1100 tickets if you are looking to fly in May. There are also some great tour packages to Derbyshire here. Ok, so that little jaunt led me to reminisce about a family vacation many years ago to Hampton Court Palace (Henry VIII’s old digs). So I pulled up the website and prowled around there for awhile. Interesting photos and articles about the palace and a reference to a recent ghost sighting. Wait, what? I didn’t hear about that. So, off to youtube to find the CCTV video of the ghost. . Even a guest at the palace that day saw it so it must be true, right? A little more reading about other spots we saw on our family vacation (Tower of London, villages in Southern England, Stonehenge – it was an amazing trip) got me thinking about visiting Derbyshire – the gorgeous scenery in the latest Pride and Prejudice movie. Well, since I won’t be traveling soon I thought I’d check the library for any books on the subject. That search found me a series of novels where Jane Austen is the detective in murder mysteries. Yeah, there really is no historic person left in the world who hasn’t been turned into a sleuth. Ben Franklin, Elizabeth I, Jane Austen…I’m sure there is a Dolly Madison or Prince Phillip mystery out there somewhere in the world. Ok, so at this point, I’m thinking about England, ghosts, Regency England and of course, Christmas. This leads me to do a little surfing on Christmas past and I read a little about the Twelve Days of Christmas (boy that song is annoying), which leads me to Rudolph the Red Nosed Reindeer, which leads me to an article that explains how bioluminescence could be why his nose glows so bright. So I guess that magic that makes him fly can’t handle glowing nostrils. It’s an hour later and I’ve seen Henry VIII’s ghost, learned about glowing reindeer noses, added a likely cheesy novel to my “to read” list and planned a vacation to England. What did I ever do before the Internet? All I can say is God Bless Al Gore for inventing it. As much as I tout the wonderful taste that is pie, I have a soft spot in my stomach (one of many) for crisps. Crisps, crumbles, buckles, cobblers – all the fruity goodness that is covered with some kind of blanket of crust. Sure pie is popular, friendly, wonderful to dance with – like Mr. Bingley from Pride and Prejudice (ok, maybe not the dancing part) but crisps have more depth. They are crisp, tart, warm but with an outer layer to protect them, a Mr. Darcy of the dessert world. 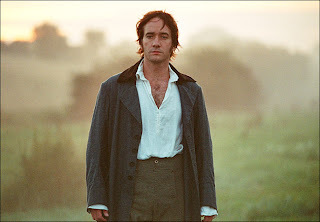 Ok, yes, I have been watching Pride and Prejudice and reading the book, what of it? Not to lose an opportunity to find my culinary Darcy, I thought I’d give a cranberry-apple crisp a try. It was recommended by Cook’s Country, which I’m always partial to, and it has cranberries, which I love. So why not? The ingredients are in my fridge right now, waiting for me to get off this computer and get to them. I’m behind schedule today, what with watching the Keira Knightly P&P again this morning (no, it isn’t the six hour Colin Firth splendor but it will certainly do). Right now, I have to run off to Home Depot for a reindeer for the front yard (NR’s request) and search out some ham shank for the klub. But I swear, after that, I’m ready for Darcy…er….the crisp. Honest.